A few days ago I was in the dollar store and I picked up a pair of white mugs. I full intended to use them for my first ever Sharpie mug project. I wasn't sure who would be the lucky recipients until I realized they'd make the perfect housewarming gift for my husband's cousin and her roommie. If you don't know how I feel about monograms by now...well then you must not be visiting 2IY enough (kidding, of course)..but I am very fond of them. I already had a black oil based sharpie paint marker so I was in business. For some reason I was totally blanking on a design (perhaps it was the 11th hour-ness of my gift) so I turned to Pinterest where I came across these adorable mugs by Simply Kierstie. 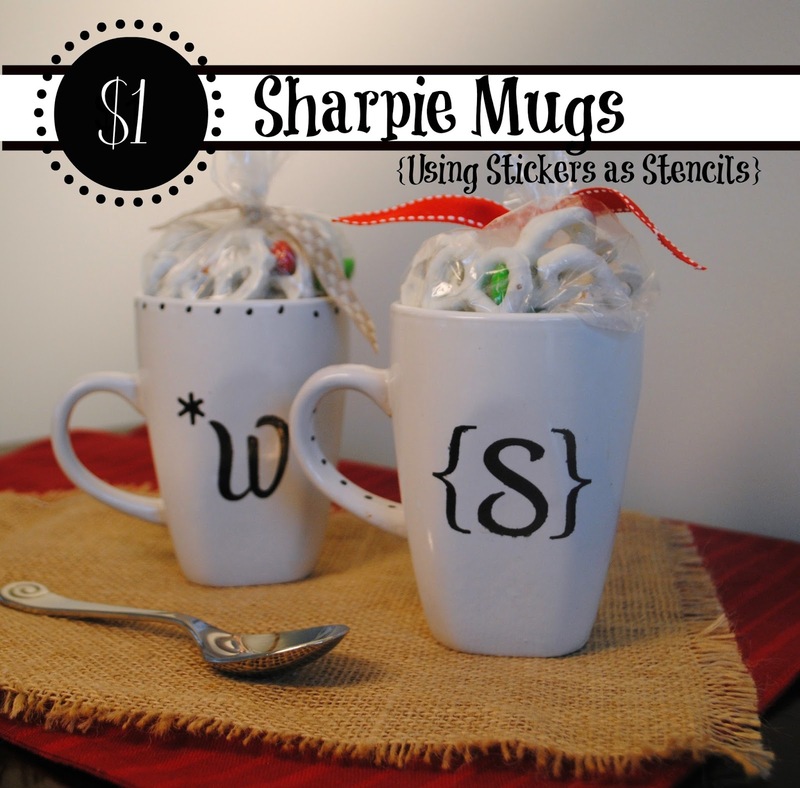 She's one of my favorite bloggers anyway so I'm not surprised I was drawn right to her Sharpie mugs of all the mugs on Pinterest (there are a bajillion). I typically use Pinterest for inspiration, but honestly why mess with perfection - and to me, Kierstie's mugs were perfect. She created her stencils using contact paper, but I didn't have any so I decided I would use stickers. I rummaged through my box of stickers and found the perfect set to trace. But then I realized it would be soooo much easier if I didn't have to trace. To make this nearly fail-proof you can actually use the negative part of the sticker (the backing) and use it to 'color in' on the image on the mug. OMGeeee EASYYYYYY!! It seriously doesn't get much easier than this. I stuck the sticker backing right on my mug, pressed down really well (you can see some ink leaked under near the bottom of the 'S'...wahhhh) and used my oil-based Sharpie paint pen to color in. I immediately peeled off my sticker stencil. I thought the mugs needed a little something more so I added some polka dots around the top rim of one and the handle of the other. Cute, right? I thought so! Then I popped them in a 425 degree oven for 30 minutes. After they cured in the over for 30 minutes, I turned the oven off, but left the mugs in there until it cooled down completely. Just rinse out and they're ready to use! 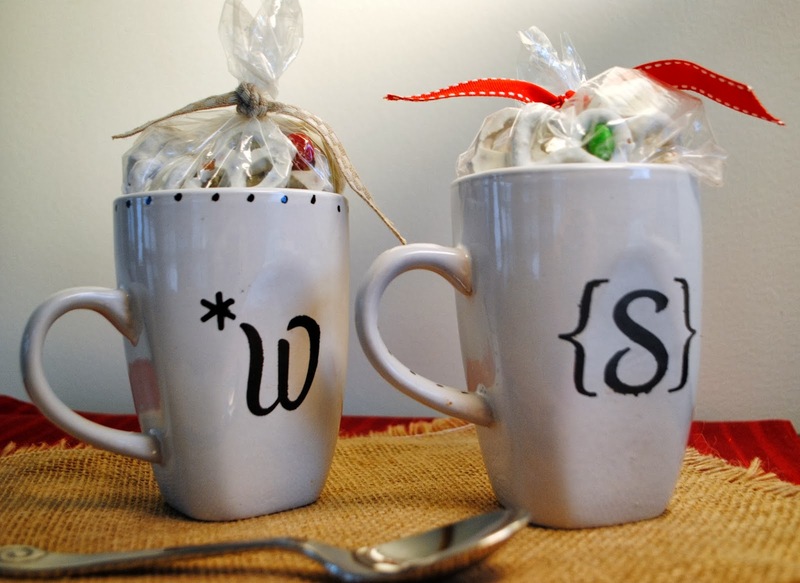 Fill 'em up with a yummy treat and these make the cutest little gifts - perfect for a teacher, a grandparent, or just about anyone really.